It’s no secret that when “No Man’s Sky” launched on Aug. 9, 2016 it was not the same game that had been promised. Ever since then, however, it has been able to live up to its name. 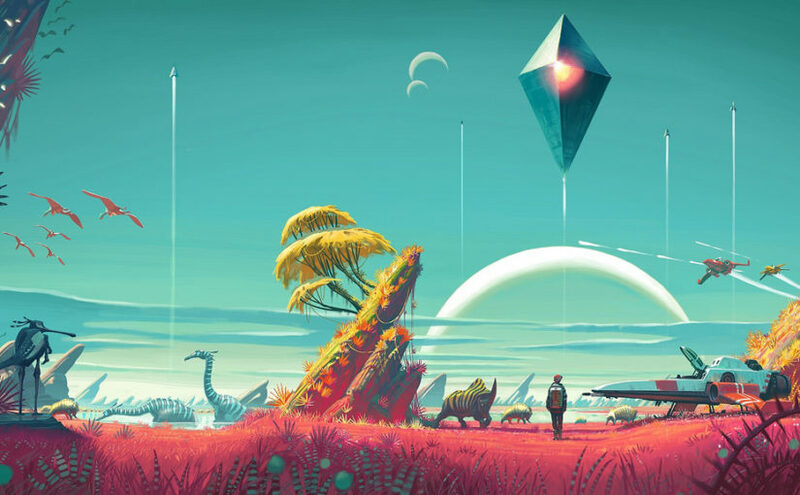 “No Man’s Sky” was being penned as the next best thing, a huge, limitless game world filled with millions of different unique planets. You could explore every single one. It truly did sound revolutionary. The game was revealed at VGX (a video game award show that has since been discontinued) in December 2013 and instantly gained the attention of much of the gaming press. It was a huge space game developed by a company, Hello Games, which was relatively unknown. At the time, Hello Games only had 16 employees. It was one of the first independently created games to be shown off at the Electronic Entertainment Expo (E3) on one of the center stage shows. It was shown by Sony at their 2014 press conference with a release date set for June 2016. This only built the hype for the game. Hello Games advertised “No Man’s Sky” as a game filled with limitless possibilities. It very quickly grew a huge fan base before it even released. People put huge expectations on the game, believing it would be the next big thing. It did not help that the CEO of Hello Games, Sean Murray, was promising a multitude features leading up to launch. Features like realistic solar system physics, very deep universe realism, multiplayer, huge variations in ships, in-depth space gameplay, factions that fight and have relations and complex animal life all set expectations high. Maybe too high. People were expecting a super realistic sandbox space adventure game, and the marketing for it wasn’t telling them otherwise. Even the graphics of the game looked incredible when they were first showed off at E3. With only 16 employees, the game looked impossible to make. After a delay, the game officially launched on Aug. 9, 2016 for PlayStation 4 and PC. It was almost impossible to live up to the hype surrounding the game. When players logged into “No Man’s Sky,” they were not greeted to a huge, limitless, in-depth, sandbox simulation of space. Instead, it felt like “Minecraft” set in space, but with way less content. The game was technically limitless; there were millions of different planets. Yet each planet either tried to kill you with toxic air, or you had to do the same exact thing you did on all the other planets — collect resources to craft things that did not affect the game or sell them to buy nothing. The game was a public relations disaster and received many bad reviews. Sean Murray even went silent and hid from the internet for a little while. But the story of “No Man’s Sky” did not end there. The group of 16 kept working and strived to make the game they promised. After staying quiet for some time, Hello Games released a large update to “No Man’s Sky” in November 2016. This update was titled “The Foundation Update,” and it revitalized the game with some more content. The update brought with it something more that you could actually do on these millions of planets. It allowed you to claim a home planet and construct yourself a large planetary base on it, which you could add special terminals like a teleporter or research station. It also brought with it two new modes that players could play in. Survival mode, which was like the normal game mode but much harder, and creative mode, which let you loose in the galaxy with unlimited resources. This update gave players one step closer to multiplayer with the addition of being able to share your planetary bases with other players, as well as adding more ship types, a land vehicle, “permadeath mode,” new base building features and much more. This update was a huge undertaking, as it added story content that took an estimated 30 hours to complete. The update also added a mode where up to 16 players can explore the same universe together, but as floating orbs. It was the first step to get to the next update: “No Man’s Sky Next,” the update that changed everything and made the game worth it. It released on July 24, 2018 alongside the Xbox One release of the game. This update represented the game that was promised initially. It redid almost every system in the game and added four-player multiplayer with complete character customization, as well as allowed players to have their own fleet of ships and the ability to build a base anywhere. Along with this update included a huge graphics overhaul and a promise from Hello Games. They decided to be more interactive with their community and committed to having weekly content updates with various community events. This revitalized interest in the game. It even became the top streamed game on Twitch, a popular live online streaming website focused on gaming content. Everyone was playing it, some for the first time and others picking it up after years of letting it collect dust. A game that was hyped so much that it was doomed to fail slowly improved. Hello Games did not give up, whereas some companies may have, in their mission to give players one of the greatest space simulator games out there. “No Man’s Sky” has become the game that was once promised back in 2016 and deserves more attention. It truly has come a long way and will most likely keep expanding as Hello Games keeps working. Maybe it will even become better than what we thought it was going to be. Many are calling “No Man’s Sky” the greatest redemption in gaming history, and it really does seem to warrant the title. A game that started off bad has now become beloved by many, and all it took was a little hard work from the developers.